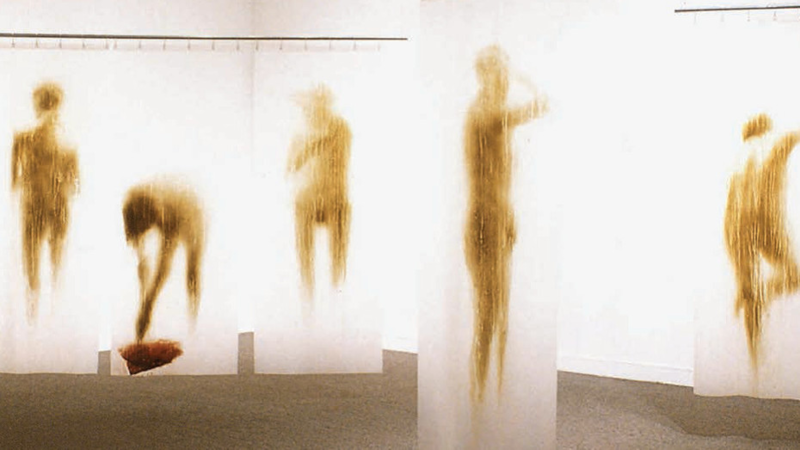 Oscar Muñoz, Cortinas de baño [Shower Curtains], 1985–1986. Acrylic on plastic, 5 elements, 190 x 140 cm and 190 x 70 cm each, various dimensions. Collection Banco de la República. Poetry is a form of human labor…the labor of reshaping human value. And Labor is the way we assert our own terms of worth against the world of capital. Both the laborer and the poet share the struggle of revealing a meaningful form out of undifferentiated matter. Poetry and Labor enable transformation through thinking and making – they help us to see beyond the limitations of a current reality, and make the impossible possible. With a performance of actions and words, laborers and poets bring something new into existence. Through New Poetics of Labor we can affirm a new reality with a language that belongs to all of us. —Are Labor and Poetry so separate from each other, and can they move beyond their coterminous existence through artists and workers’ identities and means of production? —What examining labor might mean for resistance, especially in developing countries in the era of postcolonial critique and globalization? —What reflecting on her/his reality as a worker might mean for the artist, and similarly, what thinking of herself/himself as an artist might mean for a waged worker? Our goal is to not necessarily answer these questions or suggest one interpretation over another. We are invested in the process of exploring what these words mean collectively with the artists who are part of this initiative, as well as with our readers.